As another year draws to a close we would like to thank everyone who has supported Image-Line and made FL Studio one of the worlds most popular DAW software applications. 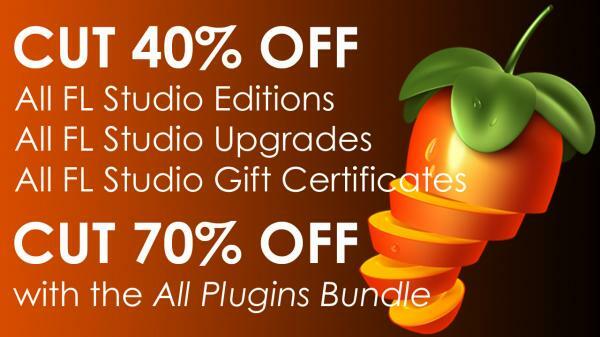 To celebrate, we are giving 40% off all FL Studio Editions, Upgrades & FL Studio Gift Certificates and 70% off with the All Plugins Bundle. You can even use the All Plugins Bundle if you already own FL Studio and some plugins. We'll remove anything you already own so you pay just 30% for the remaining plugins. NOTES: 1. The discount is applied at the time of checkout, so proceed through to the last page to see it. 2. This offer can't be used with other coupons or promotions. Ihr könnt noch ein wenig bei den Downloadversionen sparen, indem ihr eine US-Adresse als Rechnungsadresse angebt (Stichwort: Borderlinx). Schade, doch kein harmor für mich dieses jahr. lieber phil.......ruf doch bitte deine netten kollegen mal an und sag ihnen,das die welt dieses jahr unter geht.hab meine sicheren quellen und diesmal ist es soweit.darum brauch ich 2 plugins für je 35 euro.ist ganz wichtig. Ich habe im Image Line Shop unter Value Plugin bundle - pick any 5 and get 40% discount, denn Harmless markiert, heißt das, dass ich es für 34,49 kriege?